What is Melbourne Recruitment Exhibition? 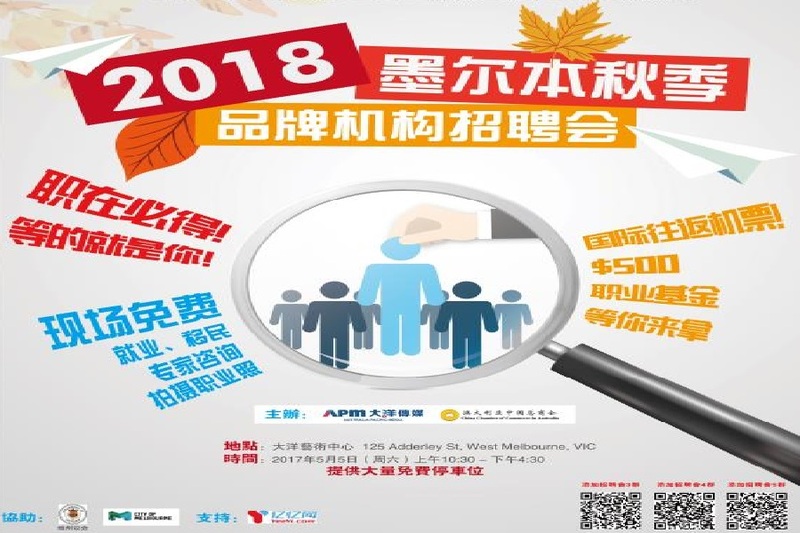 Presented by Pacific Media, the 2018 Melbourne Autumn Enterprise Recruitment Exhibition is coming on this May 5th. The event will showcase a vast array of career opportunities and career advice from employers across a range of industries in an exciting format. In 2017, as the golden medium between bilingual talents and organisations, Pacific Media had presented three recruitment exhibitions together with several local Chinese organisations and student associations. The exhibitions attracted thousands of talents with nearly 85 exhibitors and were promoted on over 20 media platforms. This year’s event is acknowledged by Victoria Chinese Students and Scholars Association and Consulate-General of the People’s Republic of China, Melbourne. With 25 well-established exhibitors, the exhibition aims to provide comprehensive opportunities and professional support for job seeking talents. It is a great platform for international students and graduates to meet with potential employer face-to-face and receive up-to-date career information. The Melbourne Recruitment Exhibition is not only where you can find career opportunities but also an excellent networking event. Remember to prepare beforehand and be well-presented on the day to make great first impressions. Plenty of prizes will also be given out to attendees so make sure you come and check it out! NotedCareers is a proud exhibitor at the exhibition this year. Our principal career consultants are looking forward to having career conversations with all visitors around career options, career paths and career objectives for international students and graduates. Would like to ask more about our service? Call us now via 1800 326 422 or send your enquiries to careers@notedcareers.com.au. Special Offer*: Register with us during the event to receive FREE Resume Check and Career Consultation.